Harmonic Research Associates - Plan 9 For Inner Space - Special Bonus Offer! Plan 9 For Inner Space - Special Bonus Offer! Tim Bost brings you practical, down-to-earth tips to reduce the impact of stress in your life today. Whether you're a trader, an entrepreneur, or just someone struggling to make ends meet, the solid guidance you'll find in this e-book can make a huge difference in your life! LIMITED TIME OFFER - ACT NOW! No matter what your occupation or lifestyle, you need to watch out for stress! It can cause major diseases, trigger accidents, provoke violence, and ruin lives. It creates billions of dollars in economic damage every year. And stress can be personally devastating, too — unless you have a plan in place to get it before it gets you! That's where Plan 9 for Inner Space comes in. In this informative, easy-to-read book, financial astrologer Tim Bost looks through and beyond the realm of astrology to bring you practical, down-to-earth tips that you can put into place right away to reduce the impact of stress in your life today. It's all fun, safe, and easy, and the follow-up resources in this book are worth their weight in gold! Stress can flat-out kill you! The time to take stress-busting action is now! 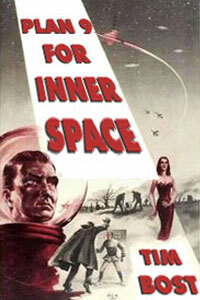 Click the orange ORDER button to get your copy of Plan 9 for Inner Space right away! PLUS - MORE GREAT REASONS TO ORDER NOW! When you order now you'll also get these amazing bonuses, too! Here's your opportunity to profit personally from three outstanding books, all rolled together into one exciting e-book! These inspirational and motivational classics from James Allen, Wes Hopper, and William Walker Atkinson are true classics. They were all incredibly powerful when they were originally written, and they're all equally powerful today! This high-octane e-book will start feeding your soul, inspiring your mind, and motivating you toward wealth-producing action right away! Click here for more information about this great e-book! It's a $49.97 value, yours FREE with your order! When you're trying to conquer stress and achieve more balance and harmony in your life, you need this inside information on using the power of your personal horoscope to turbo-charge the Law of Attraction! When you correctly apply these high-powered techniques that have been customized for every zodiac sign, you can instantly bring into your life more money, more romance, better health, and anything else you truly desire! Astrology and the Law of Attraction is truly a one-of-a-kind e-book experience-- it puts the Law of Attraction on steroids, and you won't believe the over-the-top results! Click here for more information on Astrology and the Law of Attraction! It's a $19.97 value, yours FREE with your order! This unique encyclopedia is remarkably brief, but it's packed with hard-to-find components to help you excel in vital areas of your mind, body and spirit. With this cutting-edge e-book on holistic personal development, you will be empowered with the specific tools you need to bring your life to the next level, dramatically improving your health, wealth and happiness in relationships! Get more information on this remarkable encyclopedia by clicking here. It's a $97.00 value, yours FREE with your order! Take advantage of this special offer today, because it's only available for a limited time! Order now and you'll get Plan 9 for Inner Space, Three Prosperity Classics, Astrology and the Law of Attraction, and The Ultimate Life Improvement Encyclopedia - all instantly available as a download for you, so you'll be able to put these great stress-reducing and prosperity-building principles to work right away! It's a total value of over $225, and it's all yours for one low price of $47. But be sure to act fast! THIS OFFER ENDS MONDAY, APRIL 30TH! Click the happy orange ORDER button now to get your e-book, your discount, and your bonus books, too!